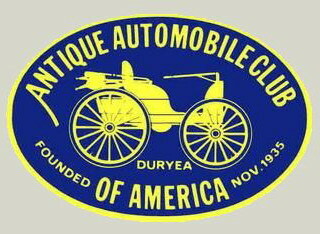 The Antique Automobile Club of America is an international organization with members in all 50 states and in more than 50 countries of the world. Its aim is the perpetuation of the pioneer days of automobiling by furthering the interest in and preserving of antique automobiles, and the promotion of sportsmanship and of good fellowship among all AACA members. There are over 400 AACA Regions and Chapters that provide local activities and represent AACA in their areas. In 2010, the AACA is celebrating its Diamond Jubilee, as it was founded 75 years ago in November 1935. Membership in the AACA is open to all individuals who have a genuine interest in the antique automobile hobby. Ownership of an automobile is not a prerequisite of membership. Adult membership is currently $35 per year and you can join online here. In 2008 the Second Generation Collector Vehicles (SGCV) Class was established. This display class is for factory-assembled manufactured vehicles that replicate the look and style of a previous make and model. Vehicles must be 25 years of age or older to qualify. This display class is for factory-assembled manufactured vehicles that replicate the look and style of a previous make and model. Vehicles must be 25 years of age or older to qualify. These vehicles have a newer, more modern driveline and chassis than the original vehicle on which the replication is based. The body may have fiberglass components and the interior may have modern accessories. A special team appointed by the VP-Class Judging will evaluate this class. The evaluation will consist of inspecting all areas of the vehicle with consideration for workmanship, condition and being factory built. After acceptance by the evaluation team, the vehicle will be certified SGCV. After certification, the vehicle owner will receive a SGCV badge at the awards banquet to be displayed on the front of the vehicle. The vehicle owner will also receive a participation "chip" from that meet. After four more participation "chips" have been received, the owner is entitled to a special SGCV "plaque board" to place the participation chips on. Vehicles will be accepted into this class after providing evidence of being factory assembled by either a copy of the manufacturer's Certificate of Origin (C of O) verifying it being a factory built vehicle or the manufacturer's "build sheet" or "production order" with the vehicle's serial number and production date documented along with a photo copy of the vehicle registration or title. Factory contact information, names and phone numbers should be included with the application, if available. All applications must be accompanied by a "C of O" copy or build sheet information along with all other pertinent documentation and sent to the VP-Class Judging. 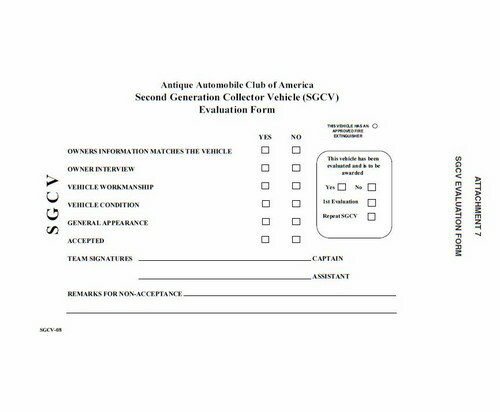 Vehicle acceptance is on a case-by-case basis and at the sole discretion of the VP-Class Judging with approval from the Class Judging Committee. Meet registration will not be accepted for these vehicles until the Vice President - Class Judging has reviewed all the documentation and approved it for entry. Vehicle owners will be notified of the decision. The AACA DOES NOT ACCEPT "KIT CAR" VEHICLES. Included in this class are factory built: Avanti II, Clenet, Glenn Pray, Shay & Zimmer. Other vehicles may apply to the VP-Class Judging. (See Attachment 7-SGCV Judging Form-p. 50). If you need assistance in gathering the documents needed to register your Clenet for an AACA National Meet, please contact the Classic Clenet Club.